Because the Area doesn't follow the same laws of nature as the Here, it can be used for several purposes, fast travel being the most common. Most paths are shorter in the Area - if one knows how to walk them. And travelling such a weird place is tricky: all who leave the Area are left with an urge. The compulsion is never the same, rarely dangerous, but often inconvenient, and irresistible. "After we had reached the gathering, we had barely explained ourselves when we collectively broke away and drew several perfect circles on the mountainside. It became weirder still when the resident stone giant came by, nodded, and hurried off." The Area can be travelled in corporeal or mental state, or by "half-travel". Each has its ups and downs; only corporeal travel allows to transport items and be almost immune to the whispered urges, but doesn't allow changing the environment. Mental travel grants great control over the environment, and protects against injury, but there's a danger of mistaking the dreamlike world of the Area for reality. Half-travel means one can be touched, but influence and carry very little. Some places have a counterpart in the Area and serve as landmarks; most do not appear in the Area, while yet others are indigenous. "I bought red floatdust for an insane price after leaving the Area. I thought I was ruined; the next day, one of Glazier's aides happily bought the whole stash. Shortly thereafter, glass armour was introduced, of which I was sent several pieces. I wonder..."
The Area is not just there for decoration, it has its uses, ranging from strange to creepy. It's quite something if a place has a mirror image in the Area - many things are represented, but not exactly as they're in the Here. Since teleportation is so damn difficult, many who had to be somewhere yesterday use these routes. "Of course I don't mind my neighbour being a naj. With her standing a full meter taller than me, we chat on the stairs." "... here we have the berry cakes, and the beverages. Make sure the elves don't get any of the blue jugs. If anyone asks, the berries make most likely a stripey leg pattern for the garren, and dwarven hair bluish magenta, but tell them it depends on which vegetables they had." Very soon after coming up with my world I decided that I wanted to break the racial barriers established by many fantasy settings, and instead aim for a more "sci fi" way of races living together. And so, there are not "elven lands" or "dwarven mountains" (although it might be called such after its population majority), but in general, all races can be found everywhere. Racism in Genius Loci is considered a mental illness, the ultimate failure of rationality, and is very rare - with a few notable exceptions (I do need bad guys). Also, gender doesn't matter. The differences between the species are so great, that those between sexes of the same species go unnoticed. Cultural heritage is defined by culture more than race, and an elf and a gar from the same land will get along much easier than two elves from different lands. Of course, you'll probably marry so you can have children, but with the new rise of shapeshifting spells, more mixed-species couples have formed; adoption has always crossed racial barriers anyway. Society does employ the natural strengths of races, putting the strong raganaj in warrior services, and the dextrous dwarves in crafts and surgery. This is still only a preference and not a rule. 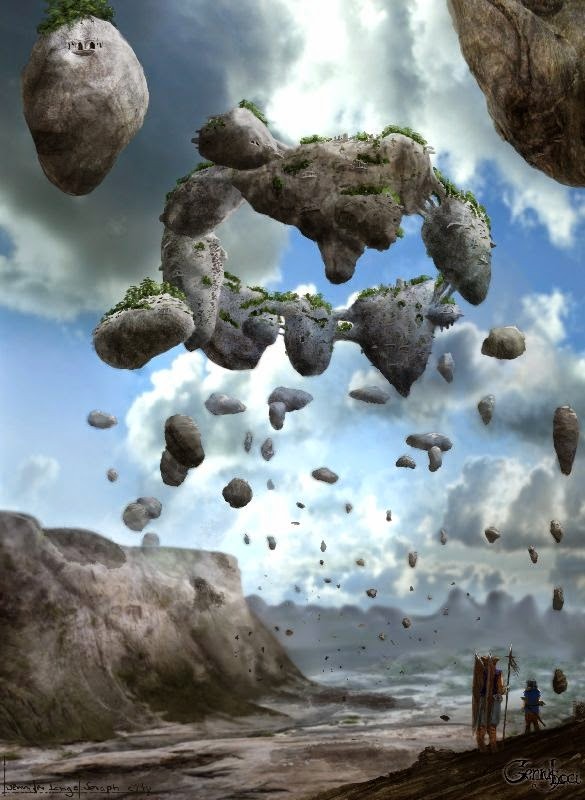 Before the Splinter War, the seraphs lived within the community, a flying people known for their crafts, and to best knowledge, shared their floatstone cities. However, in the War, Nirill fell, and when Minaaré was invaded shortly after, the attackers were turned back within the day. The day after that, all grounddwellers forgot how to reach the cities, what was in them, and even what a seraph looks like. Since then, the seraph cities can still be seen, but not a single person has entered. The extent of the Forgetting is so massive that it's certain they cast a spell - and frighteningly, still keep it up, some two millenia later. "Nuralk says he met one; he claims they walk like silk in the wind, but can remember little else. One can't help but wonder who else may have met seraphs and forgotten, when even their pictures on Agorisai's palaces were erased." Theories speculate the Forgetting wasn't intentional, that seraphs have meanwhile died out, or were successfully invaded by the shapeshifter armies after all. It has been in much debate how to handle the situation. All attempts to reach the cities have failed. The Bargassian and Lebridgian engineers can't come up with a solution, and no flyer however good can make the trip. The only sign they might still be there are floatdust miners in Rhagastone, who occassionally are found bound and gagged when they became too clever at the marked borders. I used to have them as regular folks around, but then picked them from the list of peoples shrouded in mystery and only to be found later in the plotline. Never fear, honoured audience, all will be revealed in time (I never said when that is, though ;)). Let's just say, seraphs must be one hell of a bunch of speakers, keeping such a spell up for this long.